The Wonderful World of Disney On Ice lets you relive the magic of your favorite animated Disney films. Join Mickey Mouse and Minnie Mouse on a treasure-filled journey bound for heartwarming adventure. For the first time ever in the UK discover the true meaning of family with everyone’s favorite forgetful fish, Dory. March alongside the seven dwarfs, as they whistle off to work to while singing Heigh Ho. Feel the rush of the stampede as Simba learns to live by the motto of "Hakuna Matata". Be dazzled by the Genie as he makes Aladdin’s wishes come true. Watch as the ice transforms into the wintry world of Frozen during Elsa’s emotionally powerful performance of Let It Go. 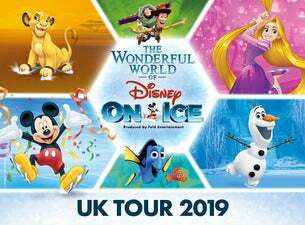 The Wonderful World of Disney On Ice brings beloved characters, both classic and new, to life through cutting-edge figure skating, incredible costumes and stunning set designs. Innovative lighting, thrilling special effects and breathtaking skating make ite an experience the whole family will remember forever.